in the beautiful Ayinger Brewery Guesthouse restaurant. Don Beistle (Dr. Brewski columnist for Southern Brew News) and I were invited by Merchant du Vin Importers to attend a special tour and dinner at Ayinger Brewery in early 2008. It has always been my opinion that the craft beers produced by this brewery (located just 15 miles from Munich) are among the very best in flavor and quality of any German beers. The text and photo album that follows contain information about the Ayinger Brewery and guesthouse / restaurant. 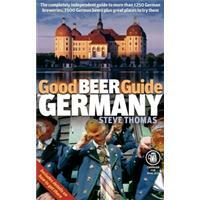 We hope that this page will encourage international travelers (who love great beer) to venture out from the larger cities in Germany to see the welcoming and beautiful country landscapes and enjoy the regional beers. Click here for more information on how to arrange a visit to the Ayinger Brewery. The brewery was founded by Johann Liebhard in 1878 in the small Bavarian village of Aying. The 4th generation current owners have the family name of Inselkammer and sincerely view the town of Aying as their cherished home. The Ayinger owners are proud proponents of the area's historic beer styles and beer culture. "Maintaining and conserving all of these cultural elements is our greatest concern and responsibility," says Angela Inselkammer. The original brewery (located in the center of Aying next to the guesthouse) was moved in 1999 to a modern, new facility just outside of town at Zornedinger Strasse 1. 150 hectoliters of beer are made in each batch at Ayinger. The sparkling new brewery was built around the goal of maximized automation, and even the cleaning process here is totally automated. Brewers receive text messages on their cell phones from the brew system when something is in need of attention. The Ayinger brewing program starts running on Sunday nights and produces 15 batches of beer a week, following by the automated cleaning program. The brewery has 80 employees and an annual output of 150,000 hl. Ayinger beers have always been honored by a multitude of awards, and the rate of accolades has seen a definite increase after construction of the new brewery. The barley comes from farmers in the surrounding area, and the elegant noble hops used by Ayinger are grown in the Holledau region of northern Bavaria. The new brewery is an impressive, state-of-the-art, automated facility that offers guided tours, a gift shop and attractive function room. The Schalander Festive Room is a complete bar and dining area formed around the upper portion of the brew kettles. Conferences, dinners, seminars and even weddings are held here on a regular basis. A 3-D film of the brewing process is also included on the guided tours (which may be arranged at individual or group pricing). Special "beer culture experience" tours with food are also possible. For the past several years the Brauereigasthof Aying has received a multitude of gastronomic awards from critics and publications throughout Germany and Europe. The guesthouse and restaurant are located in the center of Aying, just a short distance from the new brewery. The restaurant has seating for 100 people and incorporates the best fresh, local ingredients. All the Ayinger beers and distillery products are also available with your meal. Bottom-fermented, light golden, malty lager. Notes of clean sweetness and honey. Alcohol content: 4.9 % - Lagered 4 weeks. Smooth and elegant with hints of chocolate. Alcohol content: 6.7 % - Lagered 4 months. Bottom-fermented, light golden, hoppy lager. Floral spiciness backed by firm, pale malt. Top-fermented, blonde, strong wheat beer. Spicy, peppery notes of alcohol and wheat. Complex with a rich, malty flavor. Clove and spice tones come from special yeast. Notes of caramel and toffee in the malt character. Clove notes blend with caramel malt complexity. The lovely Ayinger guesthouse and restaurant saw some impressive renovations a few years ago. The restaurant and guest rooms are exquisite. Tour guide Otto discusses the range of fine German malts used in the Ayinger beers. Otto pours an unfiltered sample of Ayinger Jahrhundert Bier for the Merchant du Vin tour group. This aromatic and flavorful beer contains yeast and proteins not found in the bottled version. The beautiful Ayinger labels are quite eye catching. Note the new Weizen Bock bottle on the far left. This strong, pale wheat beer will be available in U.S. markets soon. Otto shows off the sampling bar of the brewery function and dinner area. Otto and Don discuss the mashing process. Automation allows the brew kettles to be closed almost 100% of the time, and this made possible the construction of a meeting facility and dining hall around the kettles. Gertrud Hein-Eickhoff, Ayinger Export Manager, discusses the range of distilled spirits produced in the small distillery in the rear of the new brewery. The spirits begin at 90% ABV and are diluted with water to the appropriate bottling strength. 1200 bottles of pear and plum versions of schnapps are produced each year by Ayinger. Otto provided samples of Ayinger's brewing water that comes straight from a well that is 176 meters below the brewery. The water is very soft and perfectly suited for the elegant Ayinger brews. The sampling fountain in the brewery is known as the Saint Andreas source. The tavern across the street from the Ayinger guesthouse is known as Liebhard's Braustuberl. 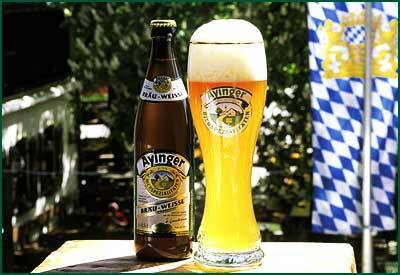 It features the full range of Ayinger beers alongside traditional Bavarian dishes. Franz and Angela Inselkammer toast with glasses of Weizen Bock during the Merchant du Vin importer dinner in the guesthouse restaurant. The delicious menu for the Merchant du Vin dinner included terrine of wild boar with Ayinger Brau Weisse, chestnut cream soup with Urweisse, duckbreast with vegetables and potato alongside Jahrhundertbier, and "bieramisu" and sour cherries with Celebrator. There is an old bowling (skittle) alley behind the Ayinger guesthouse that dates from the 1800s. The original wooden skittles are set by hand and bowled over by 100 year old, compact balls. Ursula, the lovely daughter of Angela and Franz Inselkammer shows how it is done.